This article has already spurred at least two responses in the blogosphere, from Derek Fincham and Larry Coben. Coben suggest that the Sustainable Preservation Initiative is designed to prevent precisely the type of looting to feed one's family that is detailed in the article -- the interviewed looter is quoted saying he does not believe he is doing anything wrong:"I have a wife and six children to support, and I do so through this business." The artifacts often wind up in the homes and gardens of Lebanese politicians and citizens and even in private collections on other continents. In February, police confiscated a child's sarcophagus dating back to the Roman empire from the Baalbeck home of a Muslim sheikh who was trying to lure in the highest bid. I'm not suggesting it is not worth trying the SPI approach, even in Lebanon. But it would seem more likely to succeed in countries without a strong indigenous demand for antiquities, and where the central authorities are more committed to combating the illicit trade. b) the priorities of tourism are clashing with those of museums and archaeologists within Kurdistan, as they do at the national level, and as at the national level, preservation is taking second place to the demands of economic development. 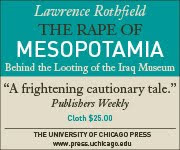 This mess, it is important to recall, stems in large part from the failure of American postwar nation-builders early on to even think about how to help the Iraqis organize its governance of cultural heritage. The position of the State Department now is that any such issues are internal matters for the Iraqis to work out themselves, but one would hope that behind the scenes some pressure is being applied, especially since the US is pumping $13 million into conservation efforts. c) Speaking of the State Department, it is mentioned only in passing, with a reference to the Erbil Institute's Cultural Heritage Project, whose newly-opened facilities were paid for by State. It would be interesting to learn more about this. The site was returned to Iraqi control more than a year ago. Ms. Ackerman and Mr. Allen said the project had already surveyed the remains, building by building, and started the restoration of two museums. Although Iraq has a large corps of trained archaeologists, they said, an immediate need is to instruct others in the conservation of ruins and bring in structural engineers and hydrologists to handle the water problem. CUNY's Center for the Humanities is hosting a panel discussion, moderated by Joel Allen, between James Cuno, Larry Coben, and me. Unlike almost every other panel on which Cuno has appeared, this one will move past the worn-out arguments about "retentionism", to focus on practical and realistic responses to the problem of the looting of antiquities from archaeological sites. Do museums recognize any obligation to do more than just say no to acquiring illicit antiquities? What solutions do museums, collectors, and dealers offer to the problem of market-driven destruction of archaeological sites? How likely are these solutions to be implemented? Would they stop looting? What alternative approaches are being proposed by archaeologists and heritage protection advocates? The moderator calls Cuno's bluff about his claim that governments care much more about symbols of national identity than people do. Is that really true? She asks him if he thinks a poll of Egyptians would show they would prefer to have the bust of Nefertiti or the Rosetta Stone returned, or be indifferent? "I have no way of guessing," he responds, surely disingenuously. Cuno must know that the image of Nefertiti is on Egyptian currency and that the Egyptian press covers repatriation stories assiduously. Of course both of these are governmentally-backed undertakings, and yes, governments use symbols of national identity to promote their agendas, but the public in Egypt would not accept the imposition of a symbol on their currency, and the press would not cover a topic if its readers were not interested. Cuno goes on to throw in the red herring of suggesting that most Egyptians would probably place many other issues (freedom of speech, for example) much higher on their list of priorities, as if one would have to choose between pride in one's heritage and the wish to make one's country or one's own life better. The argument against nationalist feeling as the basis for claims to cultural patrimony, then, is: nationalism is a conspiracy by governments to create identity where none exists, to invent traditions; luckily, most people have no deep investment in national identity, despite the efforts of states, so we can discount any claims that certain objects really are connected to a people. But what about where people of a country, say Greece, have somehow internalized the invented tradition and show they do care, in ways that cannot be poohpoohed as merely the effects of governmental incitement? In that case, their caring is outweighed by our caring more about the tradition that has been built up (i.e., not invented) over several hundred years while the Elgin marbles have resided in the British Museum. The moderator does a fine job of continuing to push Cuno, asking him whether then he would be happy if, say, the Declaration of Independence had somehow been taken back to London (she might have done the thought experiment by imagining this happening in the War of 1812). Cuno said it would not bother him at all. Incredulous, the moderator asks whether it makes no difference viewing the Declaration in the context of Washington, DC. Not to Cuno. Authenticity, yes; context, no (unless the context is the museum's collection, apparently). Unfortunately, time ran out before the conversation could really come to grips with the issue which is much more pressing than that of repatriation: the problem of looting today. The recent adoption of more stringent rules for acquisition of unprovenanced antiquities gives Cuno the chance to point out that very few antiquities are being acquired by US museums today. Gerstenblith raises the question of whether museums are using the same standards in accepting donations from collectors, but time runs out before that can be answered. The follow-up question, which never gets raised, is whether museums should go beyond the "clean hands" position to something like "active engagement" in protecting archaeological sites from destruction at the hands of looters (as well as by development). What does Cuno think could and should be done about the problem of site destruction? The International Association of Dealers in Ancient Art has added a new page collating "some scholars' opinions" about matters such as the importance of archaeological context (answer: not at all important) and the right of archaeologists to "show off" as guardians of the cultural heritage of mankind (none, apparently, insofar as they fail to publish their findings in a timely way). This collection of quotations is most helpful in clarifying the logical weakness, not to say intellectual bankruptcy, of the arguments IADAA takes to be slamdunks. Take, for instance, the straw-man claim reiterated again and again by Cuno and de Montebello that archaeologists believe that antiquities have no meaning outside their archaeological context. Perhaps there are a few, but the vast majority of archaeologists recognize the obvious fact that artifacts can be studied by art historians for their aesthetic and iconographic value, or (if they bear writing) by epigraphers. The archaeologists' position, rather, is that archaeological context supplies meanings which aesthetic, iconographic, or epigraphic analysis often cannot supply, and that the contextual information supplied by archaeologists can and does serve as a control and check on the hypotheses of art historians and textual scholars. If the archaeologist who says "no meaning without context" is a straw man, the museum director who says "context has no meaning" is all too real, however. Such claims -- or the pseudo-stastical "only 2% of what we know comes from context" -- are as silly as the ones purportedly made by archaeologists. It is a strange argument that does exactly what it accuses its opponent of doing. Even where there is an argument to be made that the legal structures designed to protect cultural heritage have failed, the experts quoted by the IADAA overplay their hand. Take the sad story of how Afghan antiquities in the Kabul Museum were left to the hammers of Taliban iconoclasts because UNESCO refused to authorize their export to Switzerland. Why did UNESCO refuse? Appiah thinks it is because UNESCO acts on the basis of nationalist ideology enshrined in its convention, an ideology that says art properly belongs in the state whose cultural patrimony it is -- even when the state disagrees that the art in question is a part of its heritage, and wants to destroy it. That is a radical oversimplification of the situation faced by UNESCO at the time, and it begs the question of whether UNESCO could have been certain in 1999 that the Taliban would actually destroy the artifacts under its control. Moreover, it is difficult to see how it is that the case of the Taliban -- surely an exceptional one -- discredits an entire international system that puts the primary responsibility upon states to care for cultural heritage within their boundaries. The response should be to close the policy loophole, as UNESCO has done in the wake of the bitter lesson of Afghanistan, not to give up on the nation-state as a means to the end of protecting cultural heritage. And who are we to blame them for this rather extreme exercise of their deeply felt faith? The major loss in this case is probably to the tourist trade... The act of the Taliban was exactly that of Moses with the Golden Calf made by the idolatrous Aaron, which he “burnt with fire, and ground to powder and scattered upon the water.” No doubt the calf might have been judged a distinguished example of animal sculpture for its day, but we do not question Moses’s motivation or deed. Yes, both drugs and antiquities are being dealt on an international market, and yes, it is important to target not just the dealers but the middlemen and, a fortiori, the looters who supply the illicit good. But the analogy breaks down when Boardman equates street dealers with antiquities dealers. The demand for antiquities is not driven by hundreds of thousands of daily users paying small sums to poor gang members; it is driven by a relatively small number of very wealthy collectors paying tens of thousands of dollars for their artifacts. In the drug trade, the big money is made by the drug lords; in the antiquities trade, by the dealers and middlemen, as the Medici Conspiracy made clear. And, of course, the antiquities trade, unlike the drug trade, operates both legally and illicitly, complicating enforcement efforts enormously. On the other hand, Boardman is right to suggest that more could be done to target the source of illicit antiquities. We know that Italy has dramatically improved its anti-looting efforts by increasing its budget substantially. The problem is how to help source countries less well-off than Italy do what Boardman wants them to do. And here neither Boardman nor the IADAA have any constructive suggestions. The answer, however, is not hard to see -- if one shifts one's analogy. Antiquities, even illicit ones, are more like oil than like drugs: they are goods that do us good, but producing them causes harm (in the form of permanently lost knowledge of our human past). The antiquities trade, one might say, generates a kind of pollution. The rational way to regulate markets that generate externalities is to internalize the costs. Make the polluters pay, and use the funds generated by taxing their trade to mitigate the harm. You want to sell or buy antiquities? Fine, but we want you to pay into a fund that will pay for more site guards, more antiquities police, more INTERPOL agents, and the like. Is that a policy position that IADAA is likely to get behind? Don't hold your breath. Italian Conference on "Cultural Goods: A 'Treasure' to Defend with the Law"
«Per capire – conclude Clemente - quanto efficace sia oggi l’azione di tutela dei beni culturali, intesi come patrimonio universale, basta ricordare i casi della Triade Capitolina, della Venere di Morgantina, dell’atleta di Lisippo, dei meravigliosi Grifoni di Ascoli Satriano e le numerose querelle internazionali in corso, perché le opere d’arte vengano restituite ai Paesi di provenienza». While restitution is undoubtedly an important facet of the carabinieri's cultural protection work, one would think that the primary measure of effectiveness should be the crime rate -- which, with regard to the looting of archaeological sites, has gone down dramatically over the past few years. High-profile restitution cases may well have contributed to this reduction in looting, though the main cause is more likely the substantial beefing-up of site-policing resources by the Italian government. «I beni culturali – commenta Clemente - rappresentano l’immagine del territorio, lo specchio della sua storia, il libro della memoria collettiva, che tanto serve a dare una identità al Paese. Ciò vale in modo particolare per la Capitanata, terra di frontiera, da sempre attraversata da popoli e culture diversi, nella quale abbondano siti archeologici». Identity on the frontier is cosmopolitan because it has been created by the history traced on the territory by the diverse peoples and cultures that have crisscrossed it. That is a far more nuanced view of cultural identity than the one ascribed by the cultural internationalists to so-called "retentionist-nationalist" countries like Italy. This sort of database is an important tool for any country seeking to develop a robust national heritage conservation program that can rationally set priorities for conservation. The only caveat is that the recording of sites is "based on the existing national registry collected by the SBAH and using available surveys". If those data-collecting mechanisms are not regularly and frequently updated -- and if time-series data is not maintained -- then there will be no way to promptly assess where damage is being done presently to sites by looting, development projects, etc. b) develop a computerized program designed to compare time-series images for sites and identify sites that have been damaged or looted. Such a project for Iraq could serve as a pilot project that could then be implemented worldwide.